Place a small skillet on the stove and add the almonds. Turn the heat on to medium. Stir or shake the almonds often (so they cook evenly), until toasted and fragrant, 3 to 5 minutes. Transfer to a small bowl to let cool. In a small bowl, whisk together the lime juice, oil, honey, salt and pepper. 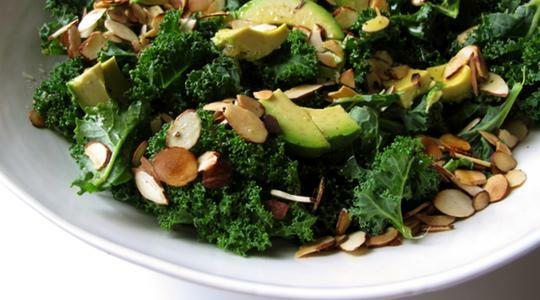 Pull the kale leaves from the tough stems; discard the stems. Tear the leaves into bite-size pieces (about 10 cups) and put into a salad spinner. Wash, spin dry, and add to a large salad bowl. 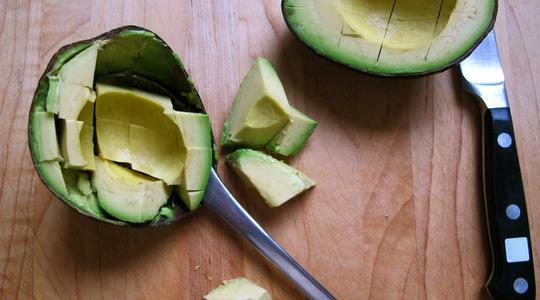 Using a chef’s knife, cut the avocado in half and remove the pit. Place the two halves, cut-side up, on cutting board. Use the tip of your paring knife to carefully slice into the avocado flesh, making a crosshatch pattern (do not cut through the skin). Then scoop out with a spoon and add to the salad. Add the toasted almonds and vinaigrette to the salad and toss well with tongs.